There is something appealing about viewing the large cities of the world from above. In certain parts of Bangkok elevated walkways allow for a semi bird’s eye view and an easier way to navigate a city infamous for its traffic. Pictured here nestled beside a hotel on a busy corner is the Erawan Shrine featuring the Hindu god of creation, Lord Brahma. 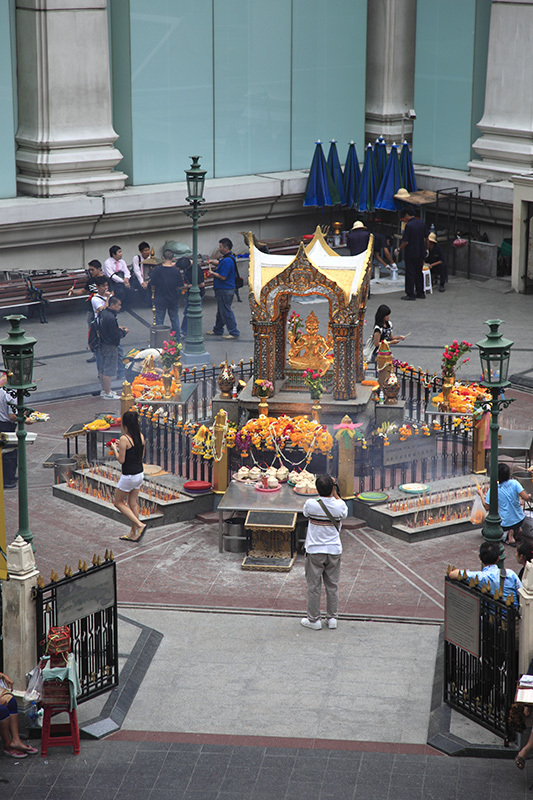 I walked by it many times during my stay in Bangkok and stopped every time to take a look. An interesting capture of this shrine that I visited decades ago. I was told then, that it was built after a worker (or workers) on the Erawan Hotel site had died after an accident during construction. Wikipedia, though, states that it was built to avoid bad karma caused by the foundations being laid on an inauspicious date. Andrew, It has an interesting history. I was tempted to write a post about it. (Still am). If it were me, I would be stopping every time too. great shot of this shrine..
What a gorgeous pic! That shrine is not something I could just walk by everyday either. It doesn't look like something that could ever get mundane. Photo Cache, I couldn't resist. Fly Girl, I don't think it could get mundane either.